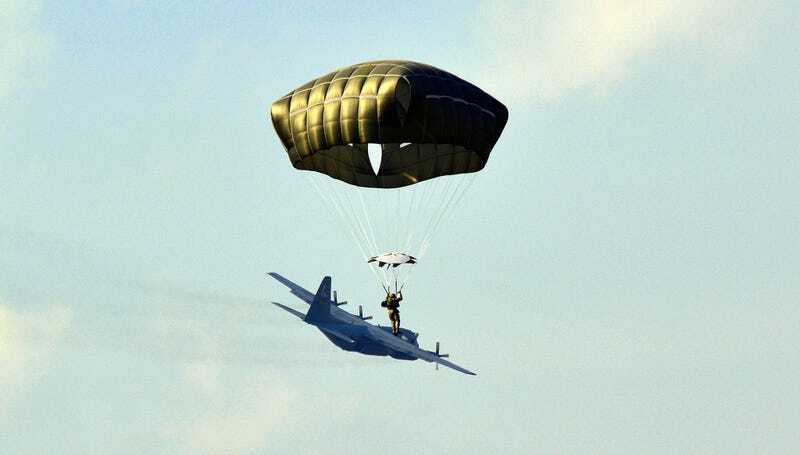 The angle of this photo of a paratrooper making a jump off a C-130 airplane is so perfect that it makes it seem like the soldier is using the Hercules aircraft as a surfboard of sorts. Obviously, he’s not standing on the plane (it’s just our perspective fooling us, or just me) but man, riding an airplane while outside the plane would be so badass. A U.S. Army paratrooper assigned to the 173rd Airborne Brigade Special Troops Battalion exits a U.S. Air National Guard 133rd Air Wing MN ANG C-130 Hercules aircraft, April 13, 2015, over Juliet Drop in Pordenone, Italy. The 173rd Airborne Brigade is the Army Contingency Response Force in Europe, capable of projecting ready forces anywhere in the U.S. European, Africa or Central Commands areas of responsibility within 18 hours.